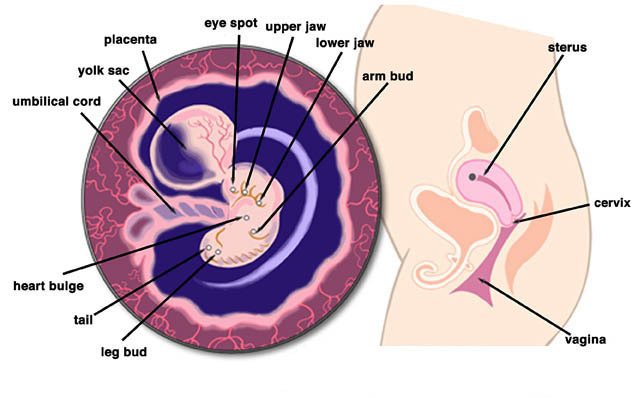 Inside the blastocyst (the early stage embryo) there is a space filled with fluid. This is now developing into the amniotic sac. Throughout the pregnancy this sac provides a protective cushion for the baby. When you hear the term 'waters breaking' it refers to this sac bursting and the onset of labour. At six weeks pregnant, the baby's spine is now beginning to form together with the early stages of the central nervous system. There is already a blood circulatory system that is connected to your own via the chorionic villi (the microscopic projections from the blastocyst connecting it to the lining of your womb). The first signs of the intestine and stomach are now present. This forms the early stages of the digestive system. The tiny buds showing which will develop into the baby's limbs are now more prominent and the facial features are beginning to take shape. The heart has now divided into two chambers and will be beating at around 150bpm, yours is only about half that! If you weren't experiencing any of the classic pregnancy symptoms before now, perhaps they have caught up with you this week. Amongst the more talked about symptoms such as nausea and breast soreness you may be surprised to find that you are experiencing headaches, which are brought on by a rise in hormones. Make sure that you stay well hydrated and discuss any painkillers with your doctor or pharmacist before taking them. Remember that Ibuprofen is generally not recommended during pregnancy. What about your emotions? The old jokes and cliches about hormonal pregnant women and their mood swings don't seem so amusing once you are the pregnant one. It is perfectly normal to find that you are experiencing ups and downs in your mood. This is largely due to changeable level of hormones in your system. On top of that, whether this pregnancy was planned or has come as a surprise, your life is about to change dramatically and this realisation can be daunting for many soon-to-be parents, both mothers and fathers. Make sure that you discuss your feelings with your partner; it is important that you let them know how you are feeling. But don't give yourself a hard time for feeling tearful about something you thought you wanted very badly as many women find themselves feeling this way. The chances are that you haven't told anybody at work yet that you are pregnant, so it can be quite a burden feeling unwell and exhausted, or emotional, and having to pretend that you are fine. This is another reason why talking to your partner is really important. Even if you feel like a broken record every evening, make sure you share your feelings with them; the more they know and understand about you and your pregnancy the better the support that they can provide for you. Remember that they are not psychic. You cannot expect them to just 'know' what it feels like. While it's important to talk through the tougher side of pregnancy, make sure you also discuss your plans for the future. There are lots of things to think about, from antenatal care to how much time you will take off work. Make the most of having such a big secret together. Yes, there is a lot to think about but this is still a very exciting time for you both. Page generated in 1.3145 seconds.